See below for a sampling of games from companies who will be attending this year's ASTRA Marketplace & Academy in Anaheim, Calif. June 19-22. Anomia is a game where common knowledge becomes uncommonly fun. Anomia plays off the fact that our minds are positively brimming with all sorts of random information: things to eat, pop songs, websites, etc... Sure, under normal circumstances, it's easy enough to give an example of a frozen food, or a dog breed; but you will find that your brain works a little differently under pressure. Easy to learn, fun to play over and over again, Anomia will have any group of friends, family, even perfect strangers, shouting and laughing out loud as they try to beat each other to the punch. It can be your turn at any time and anyone can be your opponent. For 3 to 6 players. One round lasts about 30 minutes. Launch date: Fall 2009. — They sell "15 to 20" Anomia games per month at Magic Box in New Orleans, said manager James Dello Stritto in early 2011. — Four of 12 retailers who attended ASTRA 2010 named Anomia as one of their favorite products at the show. — “Anomia is really great; I’ve been told for the last year to get it,” said Kristen Pollard, owner of Mudpuddle Toys in Marblehead, Mass., in summer 2010. 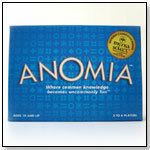 — In an August 2010 survey, nine percent of 43 retailers said Anomia is a card game best seller. Barbara Fineblum, owner of Barston’s Child’s Play in Baltimore, Md., told TDmonthly the same month that her store sold 89 Anomia games in one month. Phone Frenzy by BUFFALO GAMES INC.
Other products from BUFFALO GAMES INC. Phone Frenzy is a board game that uses everyone’s mobile phone as the primary game component for calling, texting, and sending photos. Every turn, players are given a challenge or activity that can only be completed with the help of one or more of their phone contacts. A challenge might be a race to receive a correct response to “Finish this lyric by Journey: ‘Just a small town girl’…” Players pick who they think are the right contacts from their phone and send them a text message with the question. The first player to receive the correct text message wins the round. Launch date: Summer 2011. Hit the Trail comes packaged in a mini backpack which includes 72 cards, 3 dice, and pencil. Each player is dealt 7 cards. The player then picks a card and lays it face up. (This is where the strategy comes in) Do you pick a lower point card or a higher point card? The Youngest player then rolls the three dice, trying to match one of the die or combination of dice to their card amount which is face up. Each time the die/dice combination match the player's card that is face up, the player gets to move the card into their “mile pile” trying to be the first to hike 100 miles. Players must beware of getting caught with a “cooler card” – like the mother bear & cubs in the trail. If you get caught with one of the three cooler cards you loose 10 miles. Other twists in the game include bonus rolls if the player’s dice totals the card amount that is face up. Don’t forget to look out for the trips /doubles rule which is when any of the dice come up with doubles or triples. You take a card from the person to your right. Launch date: May 2011. The Sneaky, Snacky Squirrel Game(TM) by EDUCATIONAL INSIGHTS INC. Kids spin the spinner, squeeze the matching colored acorn with their Squirrel Squeezers, and place it in their log. The first to fill their log with delicious acorns wins. But players need to look out - they could spin "steal an acorn" or "lose an acorn." An enhanced version of Tic-Tac-Toe, this game includes six magnetic game pieces: 3 0’s marked “1”, “3” and “5” and three X’s marked “2”, “4” and “6” — and a 3 x 3 game board grid. The pieces are played in numerical order. Once the six pieces are on the board, play continues in sequential fashion, with each move exposing the now-vacated square to the opponent. The action ends only when the first player achieves a three-in-a-row combination. Befuzzled by FUN Q GAMES, INC.
Other products from FUN Q GAMES, INC.
Players take turns flipping over cards that show different shapes. The first to complete the correct action wins that card. The game keeps it exciting by shuffling the actions and their corresponding shapes after each round. Can players name a movie with 2 sequels? How about a music group with 3 members? Players test their numbers know-all in this fast-playing “name it to claim it” party game. Draw a category card and then fill in the blank with the number rolled. The first person to name something that fits is smarter than the average Joe. Contents include 200 cards, Custom die, and Rules of play. Requires 2 or more players. Estimated game time is 15 minutes. Say Anything Family has 350 family oriented questions that allows families to enjoy the laughter and fun of the original party game. Ask a fun opinion question, everyone else comes up with an answer, secretly pick which one you like the most, everyone bets on what they think you just picked. Reveal the answer and score. "This game is fun for both parents and kids, while helping kids develop social interaction skills," Luke Warren, a rep for North Star Games, told TDmonthly. Launch date: March 2011. First, a crazy definition is read to the group by the "Wordmeister." Next, players must grab three random word cubes and create a new word to fit the definition. Each new word is read out loud, and the "Wordmeister" picks the best one. The player whose words are chosen the most wins. 3-7 players. Launch date: March 2011. — Why it won: Fauxabulary is a great game for large groups. It's similar to Apples to Apples, but creating new words out of different word-parts encourages kids to think creatively, and have fun with letters. 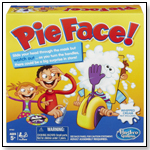 It combines the silly group fun of Apples to Apples with the fast-paced scramble to create and find words like Scrabble or Boggle, and is reasonably priced relative to similar party games. 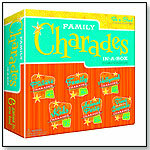 With easy and challenging charades, and with charades for different tastes and interests, the Family Charades In-A-Box Compendium can be played by virtually any member of the family. It includes six games, one each for ages 4+, 7+, 8+, 10+, 12+, and 14+. 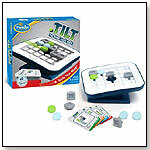 Tilt is a dynamic multi-challenge maze game that requires a player to tilt the game board back and forth, and left and right to navigate the green sliders through the center hole. The challenges progress in difficulty, and each challenge card comes with a hint, just in case players need a little help. Launch date: March 2011. 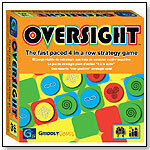 Oversight by GRIDDLY GAMES INC.
Other products from GRIDDLY GAMES INC. Exercise your mind and outwit your opponents with Mosaic 4, the new fast paced 4 in a row abstract strategy game! Mosaic 4 is set up on a board of movable squares. Two to four players compete to be the first to get 4 tokens in a row. On their turn, each player can either place a token on the board, or shift an entire row or column of movable squares over by one space. The rules are simple but the game gets increasingly challenging. Mosaic 4 comes with instructions in English, Spanish, German and French. "The movable board squares add an extra challenge," Mary Lin from Gridly Games told TDmonthly. Launch date: April 2011. 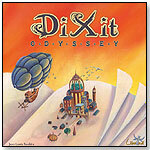 Dixit Odyssey lets even more players have fun than ever before. Anywhere from 3 to 12 players can participate in this storytelling game. One player is given a picture card, while the other players receive a hand of six pictures. The designated storyteller uses a word or phrase to strategically hint at his picture, and the other players each choose one of their cards that best fits the description. Everyone then bets on which picture belongs to the storyteller. Game play takes approximately 30 minutes. Launch date: July, 2011. — As of 05/11/2011 a previous version of this product (Dixit) had 4.7 out of 5 stars on Amazon.com, based on 41 reviews. The product had only one rating below 4 stars. Pros: Creative; equally fun for adults and children. Cons: A reviewer who gave the game three stars said the scoring system was overly complicated and that the pictures on the cards are almost too elaborate.